Twenty years ago this month, a shadowy figure from Peter Parker’s past returned in Spectacular Spider-Man #216, setting up what many consider to be one of the most controversial and reviled storylines in Spider-Man history. “The Clone Saga” reintroduced the world to Spider-Man’s genetic clone, a character that had been left for dead and forgotten about in a Bronze Age story that was originally published in 1975. 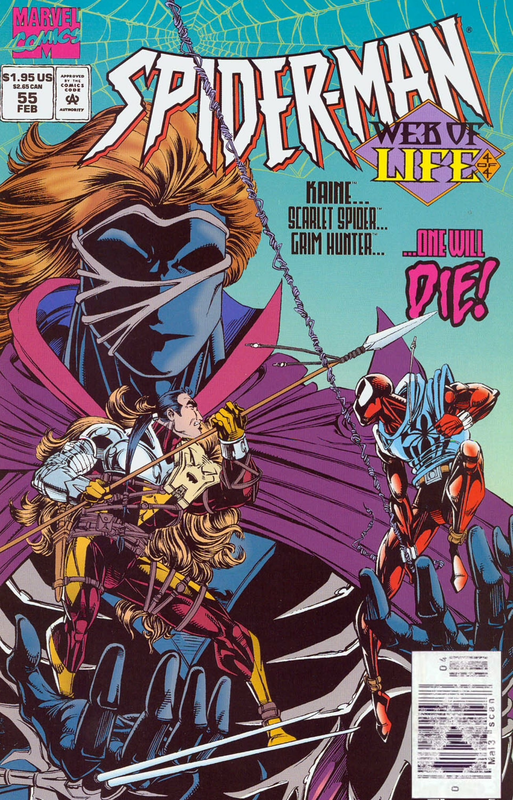 Despite the fact that no one was ever clamoring for the clone’s return, Marvel’s editorial team saw the storyline as an opportunity to drastically shake up the status quo for their Web Slinging superstar, similar to what DC had recently accomplished (to the tune of great sales) with “The Death of Superman” and Batman’s “Knightfall” arcs. 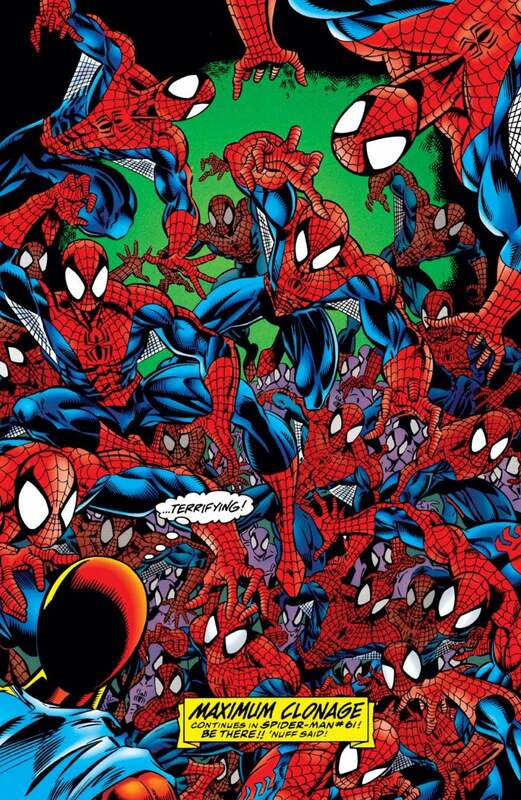 In that regard, the “Clone Saga” was initially a success, as all four core Spider-Man books were transformed into a weekly soap opera following Peter and his clone, who dubbed himself Ben Reilly, as they fought the Jackal and the mysterious Kaine. 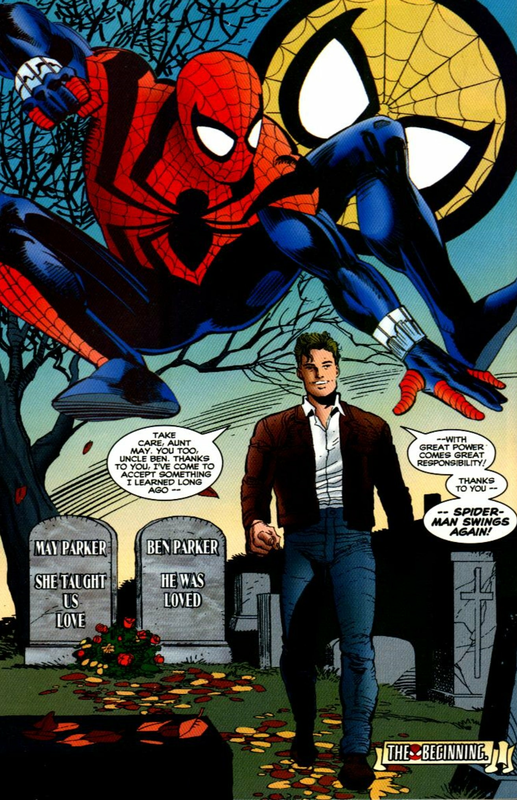 The story regularly took a number of twists, including the earth-shattering reveal that Ben was actually the original Spider-Man and Peter was the clone. However, as the arc lumbered on with Ben as the lead character and Peter and MJ away from the spotlight, reader interest waned considerably. Fans found that many of the plot twists were convoluted and inconsequential, and that the storyline dragged on for far too long (more than two years and at least 100 individual comic book issues when it finally wrapped in late 1996). Except some of these flaws are a bit overblown. Sure, the "Clone Saga" dragged on for way too long, and things like what was the deal with the skeleton that was dug out of the smoke stack, and what exactly did the returning Norman Osborn do with Peter and Mary Jane’s baby were never resolved. But there is also plenty of gold to be mined from the saga, especially the first year or so of stories, which feature a number of exceptional individual issues and arcs that are among the best Spidey tales from the past 20 years. So rather than beat up on the “Clone Saga” for the umpteenth time, this list takes a look at 10 great things that came out of the storyline. After bringing back Peter’s long-forgotten about clone in the “Power and Responsibility” arc, Marvel’s Spider-team of creators then had to figure out a way to get fans buzzing about the mysterious Scarlet Spider, Ben Reilly. And there’s no better way to bring in casual readers then by including an alien symbiote in your story – in this case Venom. 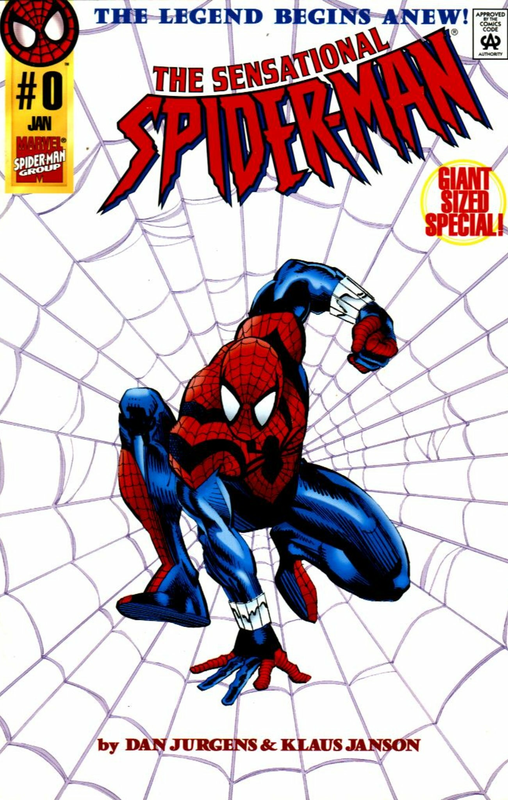 In late 1994, while Peter was teaming-up with Daredevil against the Vulture and the Owl in the Amazing and Spectacular Spider-Man series, Marvel put the spotlight directly on the Scarlet Spider in the Web of and Spider-Man books. That's when Ben debuted his now somewhat iconic “blue hoodie” costume and set out to apprehend the guy the regular Spider-Man had seemingly been ignoring in Venom. At this point in time, Venom was in the midst of his “anti-hero” phase, and what Ben failed to realize was that the reformed villain and Spidey had struck an agreement to stop fighting each other. Still, Venom was more than happy to fight a pretend Spider-Man in Ben. Ben does manage to subdue Venom (using the super-cool “impact webbing”), proving himself to fictitious New Yorkers and very real readers that despite being a “clone” of Spider-Man, he was just as capable, if not moreso, of being a standout superhero. A recurring theme in Spider-Man comics is that things never break right for Peter Parker (aka, "the Parker luck"). 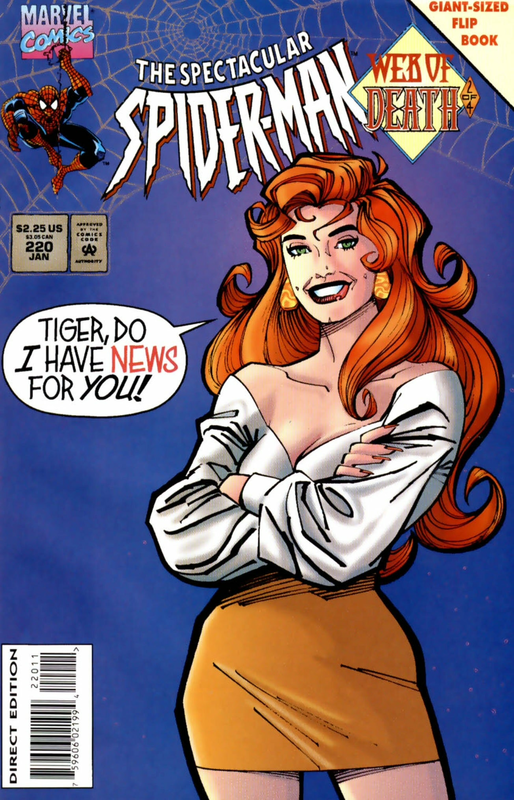 So it was a shocking change of pace when the Spider-book team decided to advance the Peter and Mary Jane marriage to its next logical stage by making MJ pregnant. The one issue where Mary Jane announces her big news to Peter, Spectacular Spider-Man #220, is especially sweet and smile-inducing, as it really feels like the two are finally going to have that happy ending. That point is further emphasized when Peter quits being Spider-Man so he could go to the West Coast with MJ and live as "normal" people while Ben stayed on as Spider-Man (more on that in a second). Of course, the Parker Luck would eventually strike again, with the very terrible “Revelations” storyline killing off the Parker baby before we even met her (though we do get to see what could have happened with Mayday Parker in the alternative timeline Spider-Girl series). That doesn’t change the fact that for more than a year in real-time, Peter and MJ appeared to have finally put all the bad luck behind them. And considering how many readers truly care about these characters, that was a wonderful thing to see. Stop me if you’ve heard this one … at one point in Spider-Man comic book history, Peter Parker became so fed up with being a hero that he upped and quit so he could try and experience what it was like to be a normal human being. In a three-part arc that mirrored the iconic “Master Planner Saga” in terms of its narrative structure and symbolism, Peter and Ben are fighting a female Doctor Octopus in order to get their hands on a serum that would save the life of Mary Jane and her unborn child. As the story marches on, Peter is depicted as losing his edge and desire to be Spider-Man, which leads to him almost being killed (and failing MJ). Fortunately, Ben is more than up for the job and saves Peter. That’s when Peter realizes that he’s just not cut out to be Spider-Man anymore, so he asks to leave town with his pregnant wife and hands over the webs to Ben, kicking off the Scarlet Spider era. Unlike past times when he quit, Peter would stay away for a decent chunk of time, before the allure of being Spider-Man (and falling sales of all the Spider-books) brought him back into the fold. After Peter officially handed the reigns of Spider-Man over to his clone, Marvel decided to reboot and rebrand its Spider-books. Similar to what Marvel did during the X-Men “Age of Apocalypse” crossover, the company ended all four of its Spider-Man books and rebranded them as new “Scarlet Spider” titles. However, that phenomenon lasted only two months before Amazing Spider-Man, Spectacular Spider-Man and Spider-Man returned with their old numbering. There would be one new book, Sensational Spider-Man, which replaced Web of Spider-Man. To help christen Sensational, Marvel hired longtime DC stalwart Dan Jurgens, perhaps best known as one of the creators that killed Superman, to provide scripts and pencils for the series (with Klaus Janson providing inks). And in case that wasn’t enough of a splash, rather than start the series with an issue No. 1, Sensational Spider-Man kicked off with a lenticular-covered issue #0. Despite all the fanfare, it did take Jurgens a few issues before hitting his stride as a Spider-Man writer. But what he initially lacked in Spidey experience, he made up for with a fresh take on the character – which was exactly what the Spider-verse needed since the book’s were technically starring a new leading player. For a lousy clone that nobody allegedly liked, Ben Reilly was hooked up with some pretty fantastic duds. During his initial run as the Scarlet Spider, artist Tom Lyle came up with the idea to give Ben a blue hoodie in order to depict the character as more of an outsider. The fashion touch worked wonderfully and is a popular fashion choice for cosplayers who haven’t completely given up on the 1990s. Then, a few years later when Ben became the star of all of the Spider-books, longtime Spidey artist Mark Bagley reportedly developed the new “Spider-Ben” Spider-Man outfit. This costume stayed somewhat true to the original Spider-Man attire, but incorporated a larger spider emblem on the front, larger swaths of blue on the legs and arms, and red and blue gloves (rather than the all red gloves of the traditional Spider-Man costume). The Spider-Ben costume was such a hit, it was later adapted for the Superior Spider-Man redesign by Humberto Ramos. Once one of Spider-Man’s greatest foes, Doctor Octopus was in a bit of a slump during the late 80s and early 90s. After being soundly defeated by Spider-Man in the fantastic “Owl/Octopus Wars” storyline, Doc Ock went through a period where he was afraid to even face Spidey, before he eventually got over those fears and reformed the Sinister Six in a storyline that paled in comparison to the Silver Age original. But J.M. 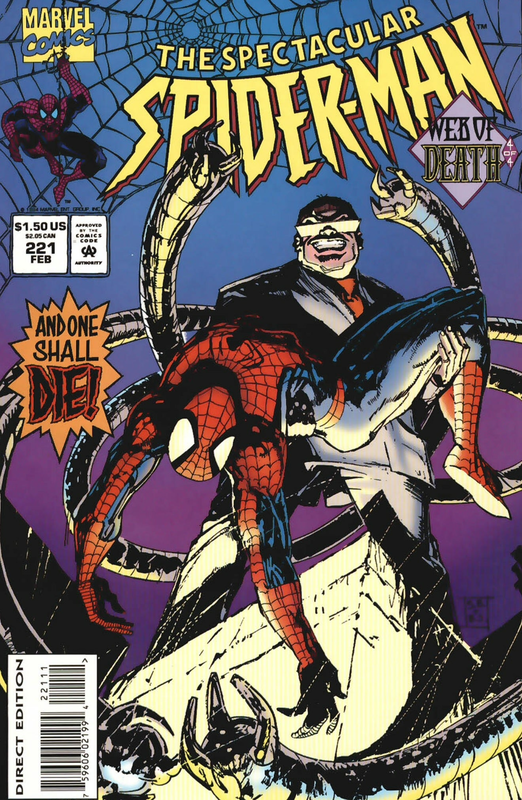 DeMatteis and Tom DeFalco scripted a winning storyline for Otto – before the character was ingloriously killed off – during the early stages of the “Clone Saga.” In “Web of Death,” Spider-Man is stricken ill when he contracts a deadly virus and his only hope for a cure rests in the hands and mechanical arms of Doctor Octopus. Otto (during his underappreciated white suit phase) decides to save the life of his “greatest foe,” but not before unmasking him and learning his secret identity. Once Peter recovers, Otto challenges Peter to one more “dance,” telling him that the two will be forever linked in conflict and can not deny their destines. Unfortunately, before the two can throw down, Spidey’s demented clone Kaine breaks Otto’s neck and kills him. Otto would naturally be resurrected at a later date, but “Web of Death” was still a pretty good way for the evil doctor to go out. With the Green Goblin (believed to be) dead, Doctor Octopus was the last of Spidey’s true arch villains that could still give him a run for his money. “Web of Death” was a shockingly cerebral story that explored the relationships between heroes and villains, and how sometimes adversaries are forced to help each other in order to maintain a sense of balance in the world. This entry will probably take some convincing. 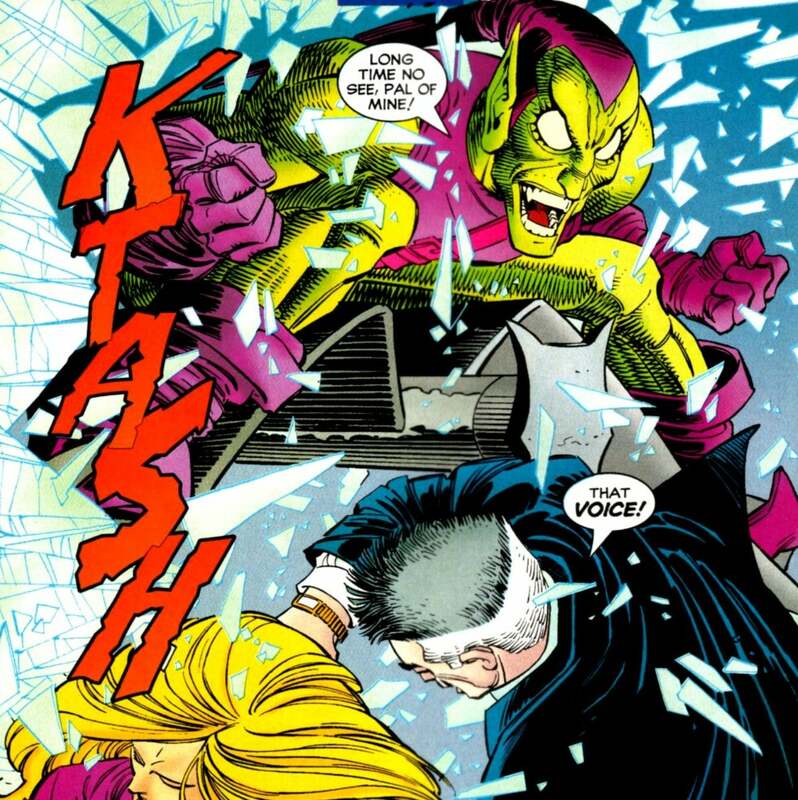 Here’s the thing about Norman Osborn’s return during the “Clone Saga” – the buildup to the reveal that Peter’s thought-to-be-dead arch nemesis was actually still alive felt like it was tacked on with the grace and dexterity of a rivet gun. 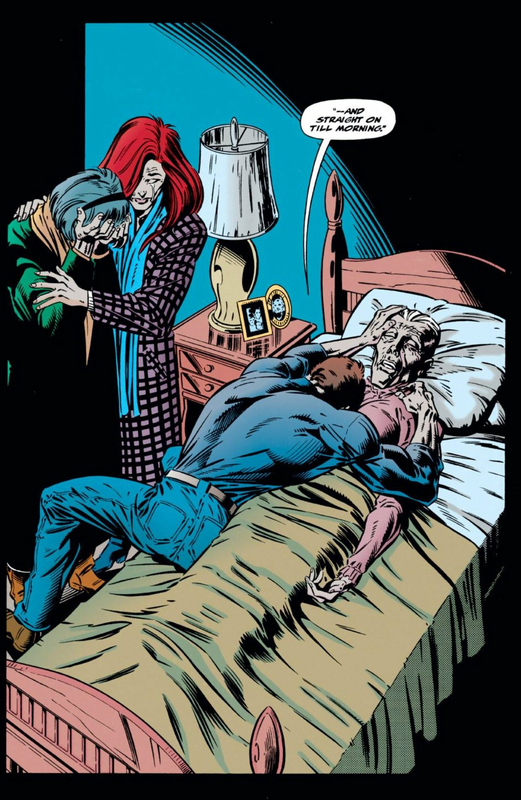 Meanwhile, Norman’s first act in returning from the grave was the kidnapping/murder/something really, really bad of Peter and Mary Jane’s newborn child, which was just really poor form, even for an Osborn. Making him the behind-the-scenes string-puller for the entire “Clone Saga” was just a bit too convenient for Marvel, who in all honesty had totally backed themselves into a corner with this story and needed some way to move forward with the Spider-books. Throughout the 1990s, mainstream comics were filled with large, hyper-violent monster villains, whether they be Doomsday, Bane or Parallax. While some effort went into developing these characters, the important thing for readers to take away after seeing guys like these was that they were bigger, stronger, and nastier than then standard supervillain, and almost always posed a grave threat to our heroes. 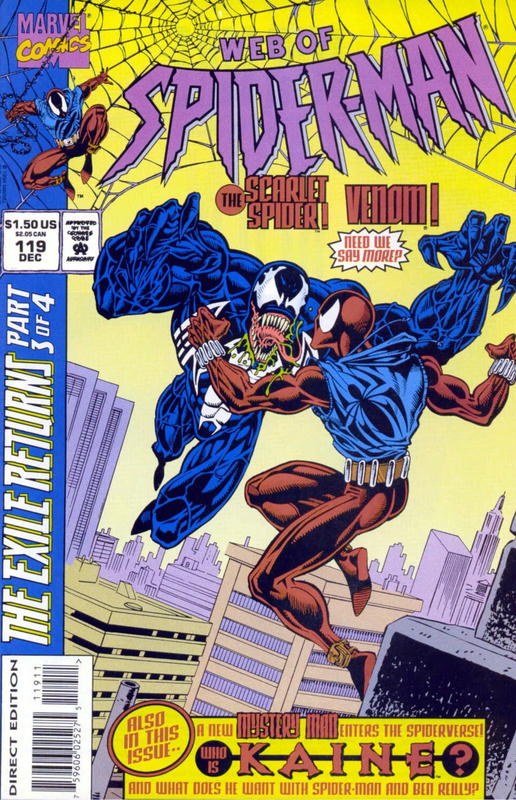 When he was first introduced in the beginning of the “Clone Saga,” Kaine seemed like another 90s monster. He would stalk Ben Reilly from the shadows, had creepy visions of the deaths of beloved characters like Mary Jane, and did his fair share of murdering (RIP Doc OcK). To top it off, Kaine wore a grotesque looking costume that was geared towards hiding his face and the scars all over his body. However, there was more nuance to Kaine than initially thought. The character is eventually revealed to be the original clone of Peter Parker. Unfortunately, during creation, there was something wrong with the evil Jackal’s formula, leaving Kaine with a degenerative condition that was bound to reduce him to a pile of good. Then, after making Kaine a bit more sympathetic, the Spider-team revealed that Kaine’s sociopathic behavior was justified by his desire to protect Peter from the Jackal and his evil cloning schemes. When Kaine eventually gives his life to save Peter during the otherwise disastrous “Maximum Cloneage” story, Kaine’s full arc is revealed and the character is redeemed. 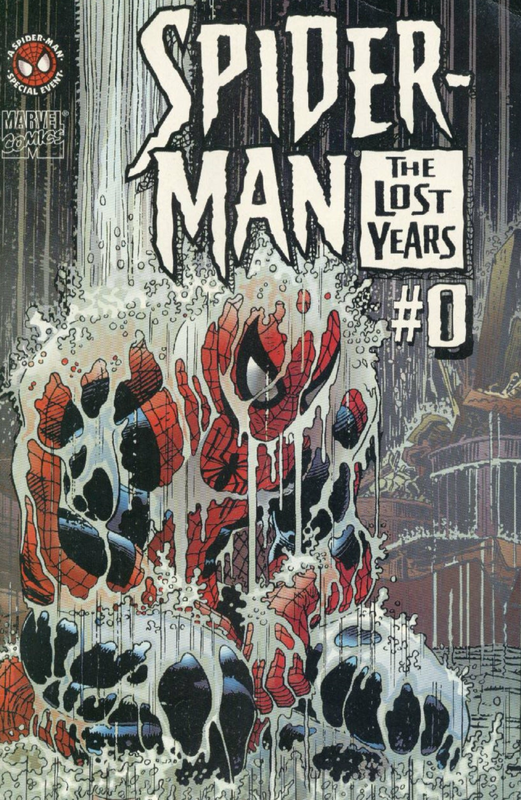 The three-part miniseries (which added a four #0 issue of previously published material at a later date) Spider-Man: The Lost Years is probably the best Spider-Man story most Spidey fans have never read. Written by J.M. 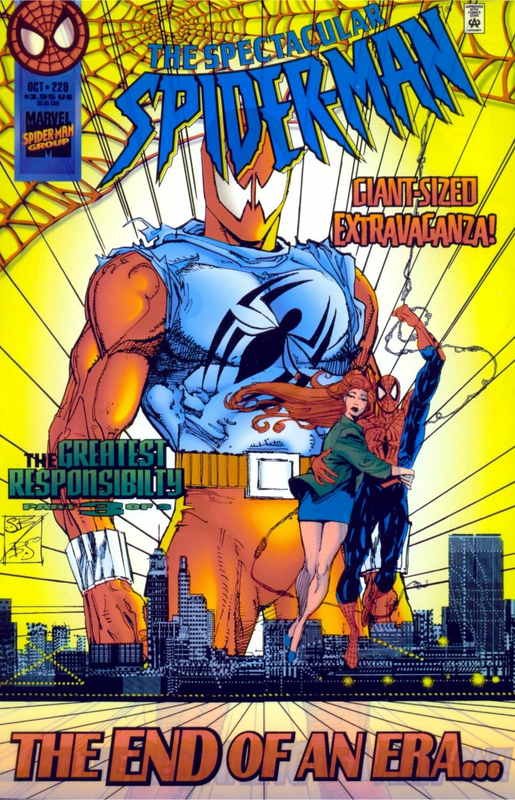 DeMatteis, with art by John Romita Jr. and Klaus Janson, the mini was published right as the main “Clone Saga” storyline was getting the most convoluted in terms of attempting to change up the main status quo for the Spider-books. But readers that did check it out got a very insightful and pensive story about what exactly happened to Ben Reilly during that five-year period where the character was supposed to have been incinerated at the bottom of a smoke stack. The series also goes a long way in providing context as to why Ben and Kaine were at odds with each other. Through this story, DeMatteis, a master of emotional storytelling, especially as it pertains to Spider-Man and his supporting cast, successfully makes both Ben and Kaine sympathetic characters. Meanwhile, JRJR, as usual, is great on pencils, perfectly capturing the dark and moody vibe the book needed. Amazing Spider-Man #400 is one of those stories that often gets lost in the shuffle when discussing greatest Spidey stories of all time because the key event that made the issue such a classic – the death of long-time matriarch Aunt May – was later retconned in ludicrous fashion only a few years later (May was in fact alive, and Norman Osborn had actually hired an actress who got plastic surgery to pretend to die ... sigh). It also doesn’t help the issue marks the unofficial end of the “Clone Saga’s” first act, which in turn leads to the next wave of stories (such as the “Trial of Peter Parker” and “Maximum Clonage”) which are not fondly regarded by Spider-Man fans. Still, that should take away from just how wonderful this comic is. ASM #400 represents writer J.M. DeMatteis at the very top of his game, crafting an emotionally gut-wrenching story that he considers to be one of his very best all these years later. Meanwhile, Mark Bagley establishes himself as one of the more underrated comic book artists of the 1990s, illustrating a story that is visually dynamic while resonating tenderness and nuance. When Aunt May passes on, while reciting Peter Pan’s “second to the left and straight on ‘til morning,” there shouldn’t be a dry eye in the house. Just ignore the ridiculous die-cut tombstone cover (it’s the 90s! ).